The Stokey Local campaign began in 2011 when Newmark Properties, the then owner of the Wilmer Place site, began consulting on proposals for a Sainsbury’s supermarket, underground car-park and (at it’s peak) 68-odd homes in a six-storey development above. The parcel of back-land, comprising a former 1940s factory, a car park, and five shops fronting Stoke Newington High Street are hard-by Abney Park Cemetery and nature reserve. Over the couple of years, through several planning applications, the developers got consent for a slightly smaller scheme. The Stokey Local community challenged each application hard and subsequently supported a legal challenge to those permissions in the High Court and Court of Appeal. Ultimately the legal case was lost, but enough time has elapsed for the key tenant, Sainsbury’s to lose interest, and they pulled out at the end of 2015. 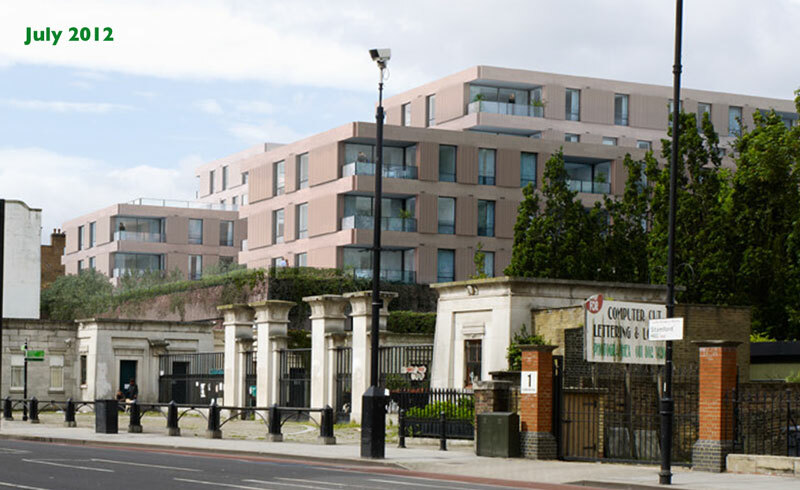 Newmark then sold their interest in the site to another developer, Reichman, who in Spring of 2017 completed the final refurbishment of the former factory building into flats, and began work on a small, 3-4 storey scheme on the car park land adjacent. Whilst the shop units fronting Stoke Newington High St remain vacant, there is now no prospect of a large supermarket on the scale originally proposed, nor of the five stories of apartments looming large over Abney Park Cemetery. What follows, and exists on the other pages of this site are the key moments in that journey. The mooted scheme before it was submitted for formal planning approval. 6 storeys plus a 90-bay underground car park, and 45 flats. The first scheme submitted for planning approval. Still 6 storeys but without a car park and now with 68 flats. Planners demanded an entire storey be removed which reduced the number of flats to 54. This scheme was refused by the Planning Sub-committee. The permitted scheme tweaked the balconies and reconfigures the flats to offer one fewer – 53 – but with more three-bed units. In 2011 a developer announced plans to build a huge supermarket on the Wilmer Place site with up to 68 housing units on top. 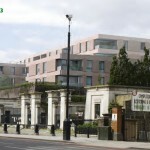 We opposed the development because of the damage it would do to Abney Park nature reserve and Stoke Newington’s independent stores, as well as the impact on local traffic and the lack of affordable housing on the scheme. Hackney Council planning committee eventually approved the plans after two applications, but the Stokey Local campaign thought there were legal grounds for challenging this decision and continued the fight against the development, and the way the planning process is conducted, in the courts. One of the main things Stokey Local campaigned against was the fact that the developer argued they could only include a small percentage of ‘affordable’ housing in the development. This is justified by something called The Financial Viability Statement, basically arguing how much money the developer will make from the project. We argue this should be publicly available so it can be challenged if it seems developers are trying to get away with providing less affordable housing to maximise profits. The problem is, not only can local residents not see these figures, even the councillors making planning decisions don’t see them – so how can they decide what the developers can really afford? Local resident Nick Perry and a team of lawyers challenged the secrecy of these documents at a judicial review, but unfortunately, the judge decided we did not need to see them to argue our case. However, Nick didn’t give up and, along with other campaigners from across London fighting unsuitable and unaffordable developments (such as the 35% Campaign for a more affordable Southwark and the Greenwich Peninsular campaigners), he’s been preparing to go back to court to argue for access to the developer’s financial viability documents. These campaigns have already successfully fought to get access to financial viability documents. This is important because it would set a precedent in preventing developers getting away with wriggling out of their responsibilities to provide affordable housing in the future. Nick was helped by planning expert Dr Bob Colenutt and Michael Armitage, a barrister at Monckton Chambers, working pro-bono. Having these experts on board seemed to get the opposition worried, and even Hackney Council got involved, hiring a top QC to defend its position – even though the documents we were arguing about were the developer’s, not the Council’s! Yet, just before we were due to appear in court, the council emailed us to give us the reports in full, saying the passage of time meant the information was now less valuable! You can see the reports and a timeline of events on our website. Putting aside the epic timewasting and the missed opportunity to argue the case in court, we now have the information we wanted and it is useful. We can see the sales valuations were too low (£500 per sq ft – this is over £800 now in N16), for instance. And we can see that the critical analysis wasn’t good enough. The planning subcommittee were misled at least twice during the planning application process. They were told the FVA (financial viability appraisal) had been reviewed externally, when it had not. Then they were told it had been updated, when it hadn’t. So the figures being used for deciding how much affordable housing could be provided were out of date. The Council has agreed to pay our solicitor’s costs after we argued their decision to provide the documents at this late stage was unreasonable. Sadly, our barrister who has so generously given his time doesn’t get paid. But the council really needs to start taking action on the financial viability ‘con’: other councils are doing it – Islington is tackling it already and Southwark and Westminster are following suit. Hackney needs to look at it too. Sainsbury’s, which was going to have the supermarket on the site, decided they no longer wanted to go ahead with the scheme. This meant the developer had planning permission for a scheme with no commercial partner. The developer, Newmark, sold the site in October to Reichmann Properties for £15.1m. Newmark had paid £6m for it and probably spent £3-4m on costs, so the developer still made money, even without a development! Reichmann Properties have consent and have all but completed a scheme to cover the current factory building in brick slips and generally spruce it up, but not build on top of it. The scheme’s flats are being marketed as ‘The Cotton Exchange’. A computer-generated image of the Reichmann scheme for the Wilmer Place factory. 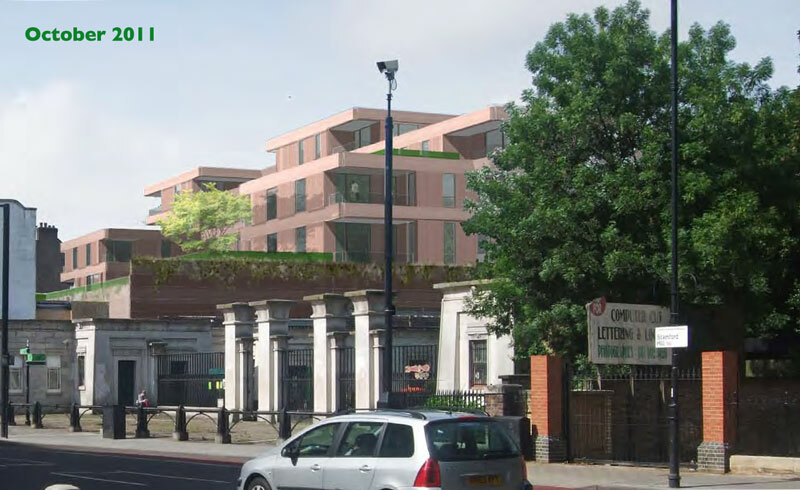 Stokey local is a loose consortium of interested residents, businesses and amenity groups who oppose the plans to build a 4,100 sq m Sainsbury’s supermarket with four storeys of residential housing on top of it at Wilmer Place, hard by Abney Park cemetery. We believe the development will, amongst other things, damage the rich biodiversity of the cemetery, ruin it’s seclusion, harm the Stoke Newington Conservation Area and the listed heritage assets of the cemetery, and have a significant, negative effect on the local economy. 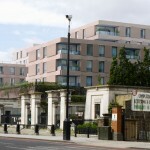 Developers, Newmark Properties, paid £6m in March 2010, for the 0.5ha site – comprising a 70-space car park, a three-story former shoe factory (home to thirty-odd small businesses and a similar number of large studio flats), and five retail units facing Stoke Newington High St, with flats above. They first published plans in October 2011 for a large supermarket with a 90-space underground car park, fronting the High Street, with 45 flats above. The scheme rose six storeys high and loomed large, over Abney Park cemetery. 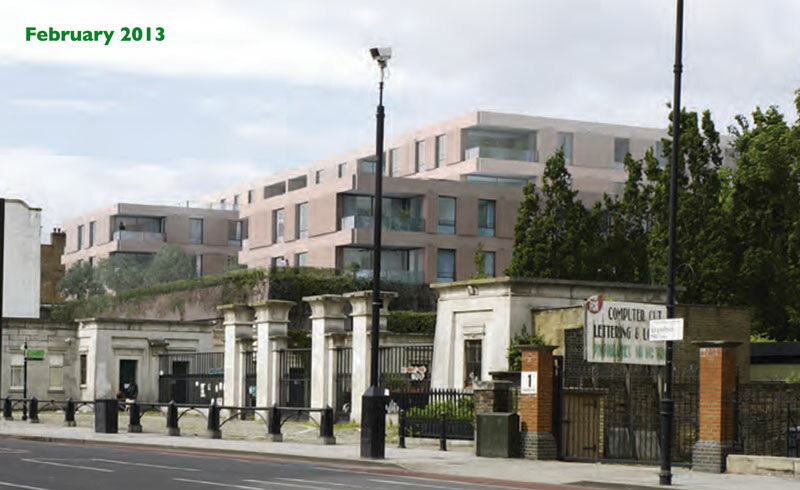 After a year of consultation with stakeholders, Newmark submitted its first formal plans to Hackney Council in July 2012 seeking permission for a six storey development comprising a store two-thirds the size of the original scheme, without a car park, and set back slightly from the cemetery, but now with 68 flats – 28% (19) of which would be “affordable”. In response to further consultation, the Council negotiated a reduction in the scale of the development by a storey and a consequential reduction in the number of flats from 68 to 54. But now only 17% (9) would be “affordable” against a borough policy target of 50%. Newmark submitted the revisions in February 2013 but despite the reduction in scale, in April 2013, Hackney Council’s Planning Sub-committee voted to refuse the revised first application on grounds of damage to the ecology of the cemetery, harm to the local heritage and insufficient family-sized flats. 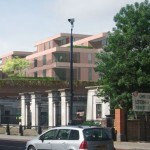 Whilst simultaneously launching an appeal against that refusal, the developer came back with a new application which was barely different to the first: it was set back by a further 1.6m from the cemetery; and by sacrificing one flat, there were now three more three-bed flats; and balconies overlooking the entrance to Abney Park were narrowed slightly. The Council’s Planning Sub-committee felt the changes were enough and the Council granted the revised scheme planning consent in August 2013. After taking advice from an experienced planning barrister who lives locally, and discussing our options with the local community at large, we challenged that planning decision in the High Court in September 2013 by requesting a “judicial review” or JR. In a bid to outmanoeuvre that first JR, in the same month, the developers submitted a third, but identical application to the last one. They hoped the Council would give the impression of considering all the issues that we’d challenged in our JR, to render it pointless, but the Planning Sub-committee ‘nodded it though’ in December 2013 under a heavy steer from officers. As a quid pro quo for granting that identical permission, the developer withdrew their appeal against the earlier refusal of planning permission, in a bid to ensure that the Planning Inspector do not get to adjudicate on their proposals. A few days later the High Court, oblivious to this third application, granted us permission to proceed with our first Judicial Review saying that there was a legal case to answer. We asked the Secretary of State for Communities and Local Government, Eric Pickles, to “call-in” the second granting of permission as we felt it raised issues of national importance and brought the entire planning system in to disrepute. But after a couple of months of deliberations, he declined to do this and so we launched a second Judicial Review in March 2014 – this time a JR of the second, identical planning permission. At a hearing in the High Court in May 2014, Mrs Justice Patterson granted us permission to challenge both planning permissions together at a single hearing. In a separate legal move, ahead of the joint JR hearing, we sought disclosure of the secret financial viability assessments that the developer has submitted, claiming they can only afford to provide 17% affordable homes, instead of the 50% required by local policy. The Planning Court and latterly the Court of Appeal, rejected that application for disclosure arguing that we didn’t need to see the viability reports in order to argue in the main JR proceedings that we should have seen it. We simultaneously asked the Information Commissioner to investigate the refusal to release the secret documents. Ultimately, after three days of evidence at the main court hearing in October 2014, Mrs Justice Patterson dismissed both our claims in a judgment that reaches far wider than our case at Wilmer Place. In it she effectively sanctions the withholding of key information not just from members of the public but from the very councillors who make the decisions – not just in planning but in local government in general. Although hugely disappointing, Sainsbury’s confirmed they had pulled out of the deal with Newmark, leaving the door open for another retailer or, more likely, sale for the site with permission to a new developer, and probably a new planning application. This is an expensive process and although our barristers worked at no cost to us (and our solicitors at a vastly reduced rate), and even though they have secured three Protective Costs Orders from the court (one for each JR and one for the earlier disclosure Appeal), we’ve spent around £33,000 fighting this case to date. The response, even in light of our earlier failure in the High Court has been amazing. We’ve raised about £34,000. if you’ve supported us either financially or otherwise, thank you!